In November and December, the New York Daily News characterized the NRA and its CEO Wayne LaPierre as a jihadists and terrorists. Now it has set its sights on Republican Party presidential candidates and leaders who are defending the plain, Supreme Court-upheld wording of the Constitution's Second Amendment and Congress's power to make laws over lawless presidential actions. 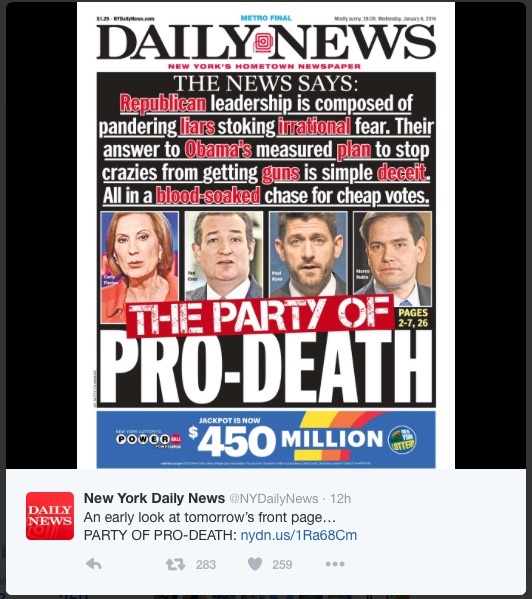 The Daily News's word choice certainly lacks self-awareness, given that it tries to play on the term "pro-life." Meanwhile, the real party of "pro-death," which calls itself "pro-choice" on abortion, is willing to stand by, some of them with great cheer, and watch as roughly 20 times as many human lives are deliberately taken during abortions every year than are killed as a result of all forms of gun violence (and about 60 times the number of gun-related homicides). Brought to tears by the toll of gun violence — and blocked in Congress by the National Rifle Association’s paranoia peddlers — President Obama on Tuesday took executive action to close loopholes on background checks for gun buyers. Republicans leapt into immediate competition for the title of extremist best able to distort Obama’s ultra-limited, ultra-reasonable directives as a monstrous government plot to destroy life, liberty and the pursuit of happiness on the shooting range. Presidential candidate Ted Cruz won faster than a trigger pull by disseminating an image of a determined-looking Obama in a storm-trooper outfit with the headline, “Obama wants your guns.” Jeb Bush’s accusation that Obama has a “gun-grabbing agenda” was weak tea in comparison. Leadership of the Republican Party is now composed of pandering liars because stoking irrational fear is selling bigtime among gun-obsessed Americans. They’re buying weapons at a record pace as if to beat the imminent closure of firearm shops. Setting aside for a moment the fact that President Obama's actions have been characterized as political theater, they aren't "ultra-limited, ultra-reasonable directives" — they are, by many if not most accounts, self-evident examples of unconstitutional executive overreach. They also make his statement during the 2008 presidential campaign that we shouldn't worry about his position on the Second Amendment because "“Even if I want to take them away, I don’t have the votes in Congress" intensely disingenuous. He may not be taking guns away (yet), but he is certainly making it more difficult for law-abiding citizens to obtain them in informal commerce. The fact is that two Democratic Party governors — Andrew Cuomo in New York and Dannel Malloy in Connecticut — have called for or engaged in gun confiscation or unconstitutionally outlawed certain firearms. The American people certainly don't need Republican Party presidential candidates to tell them that they need to arm themselves in case their future right to do so is jeopardized. After Connecticut imposed background checks and required purchasers to take safety courses, the state’s gun murder rate fell by 40%. 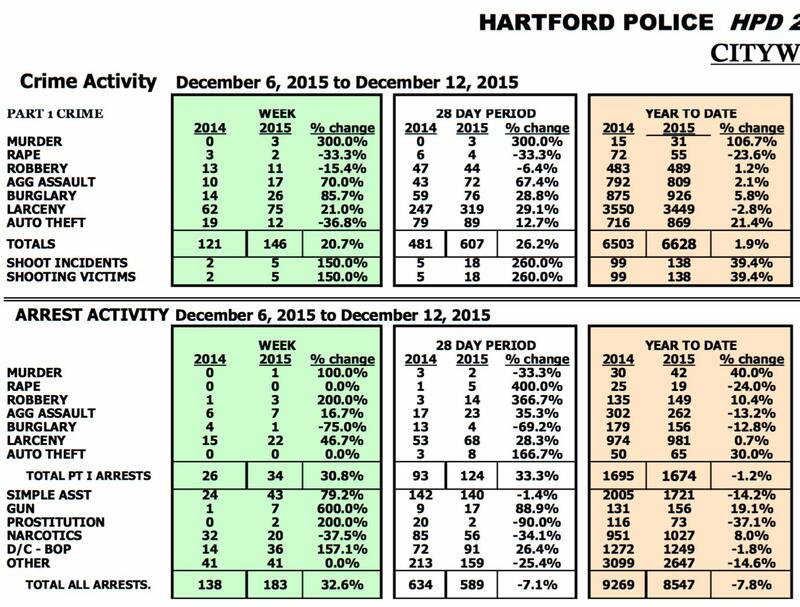 Murders in Hartford more than doubled in 2015, going from 15 the previous year to 31 (through December 12). New Haven homicides also increased in 2015. New Haven and Harford are the third and fourth most dangerous cities with populations under 200,000 in the U.S. It would seem reasonable to assert that the Nutmeg State is seeing murders rise because criminals — with or without guns — are more confident that their targets are unarmed. And maybe, just maybe, the problem isn't what Republican presidential candidates are saying. Instead, it's what Democratic Party mayors aren't doing to keep their towns and cities safe. The Daily News apparently wants to see the rest of the nation regress into the kind of lawlessness we're seeing in Connecticult. No thanks.